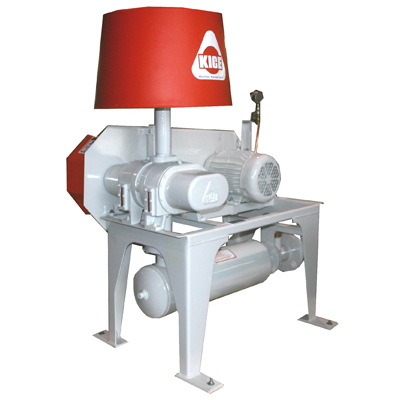 A recent addition to the Kice PD Blowers are the Kice filter blowers, PDF2000 and PDF2500. Incorporating the same features as the original four sizes, these two units are ideally suited for baghouse filter cleaning systems. While each model is capable of running over 3000 rpm, Kice designed each unit to run significantly slower. Most blowers are limited in this area due to heat. In general, a blower must run at a minimum speed in order to move enough air to cool itself. However, the Kice blower is designed to run cooler than all other blowers and in turn runs slower than all other blowers. Thanks to slower speeds, bearing life is estimated at 150,000 hours and noise levels are greatly reduced. 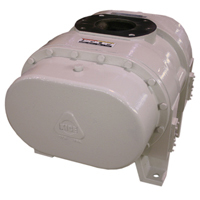 Kice PD blowers use heavy, cast iron bodies and rotors. Quality of castings are key to blower performance, and Kice is able to strictly monitor casting quality because Kice owns the foundry that pours them. CFM Corporation is a wholly owned subsidiary of Kice Industries and provides all of the castings for Kice PD blowers. Our unique rotor tip design reduces slip by 5-13% when compared to other blowers. Slip is a measure of air that ‘slips’ through the clearances from the outlet to the inlet and is the major cause of heat gain within the blower. With reduced slip comes lower operating temperatures. These lower operating temperatures reduce the need for exterior cooling ribs and allow the Kice PD blower to have a perfectly smooth external geometry. The Kice PD blower comes with an oversized shaft that reduces the chance of shafts being broken or damaged from overtensioning of belts. 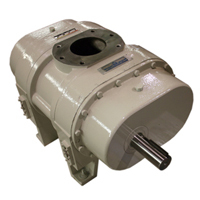 Kice PD Blowers have an additional bearing on the outboard side of the drive shaft. The extra bearing reduces the overhung load felt by the drive shaft and the internal bearings. Internal bearings are oversized-like everything else on the blower. 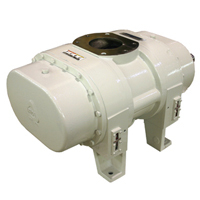 Expected bearing life is 50% – 100% higher than all other blowers. With its unique oil seals, the Kice PD blower is virtually leak proof. Given these unique seals, breathers are not required. It is not uncommon for oil to escape other blowers through their breathers. State of the art seals eliminate oil leaks. The elimination of breathers keeps oil contained inside the unit. Extensive testing shows that Kice PD blowers run more efficiently and consume less energy than other blowers available. For detailed test results, please contact Kice Industries.